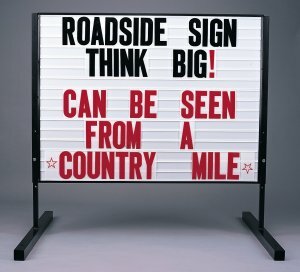 Get signage that evolves with your business messaging! These changeable letter signs and banners let you make adjustments on the fly. At Sign Bracket Store, we supply a range of outdoor changeable signs including roadside post and panels, portable A-frames, banners and more. Whether your business needs changeable signs to reflect different seasonal hours, or it's a roadside auction house that posts weekly events, find a signage solution right here online. All outdoor changeable signs are durable and include an assortment of easy to read numbers, letters and characters. By clicking on categories and products below our online customers will find more details including sign dimensions, parts included, pricing and estimated shipping times. Changeable letter signs may be ordered with expedited shipping for additional cost. Enjoy the benefits of outdoor changeable signs for your ever-changing business needs. Keep your signage displays current with outdoor changeable signs supplied by Sign Bracket Store. This online assortment features changeable letter signs on a diverse scale. From window-mount store hour signs, to oversized roadside panels, find the changeable signs to keep up with your business needs. Changeable letter signs are particularly popular for venues that host events regularly, restaurants that want to post daily food and drink specials, and retail establishments that need to advertise sales and other information of interest to potential customers. The interchangeable letter format is invaluable to business owners who want to save on time, money and resource expenditures. Use a removable letter banner as a marker for a mobile food truck or employ the roadside post and panel changeable signs to mark a fruit and produce stand. An ability to switch letters in and out as needed is instrumental for business signage that depends on changing schedules, products or the posting of events. Bars, restaurants, auction houses, farmers markets, retail outlets, grocery stores and more can benefit from interchangeable signs to display the latest inventory, specials and other goings-on. Products featured in the category above are primarily heavy-duty outdoor changeable signs with a removable letter option. Some signage options may also be appropriate for interior use. Each sign comes with a suitable kit of letters and numbers. Customers who choose an interchangeable letter and number format find it easy to add, remove and replace characters as needed. Change seasonal hours of operation, post the times of upcoming town hall meetings, or alert customers to an upcoming shipment products. Whatever you need to display, changeable letter signs make your messaging easy and clear. To learn more about the changeable signs available at Sign Bracket Store please click on products and categories below. Our convenient online store allows customers to browse products in detail. Descriptions include sign dimensions, installation information, pricing and estimated shipping times. Expedited shipping may be requested and is subject to additional charge. Please call toll free with questions or for bulk orders.